I am a sucker for a cup of coffee. Whether it is good, bad, or indifferent, it makes no difference—as long as it is black and strong. I have been known to find a reason to go into the bank or the corner drugstore just to walk out with a free cup of lukewarm, bad-tasting java brewed hours earlier and now housed in one of those hand-pump thermal carafes. Coffee and I go back to my college days, but my coffee epiphany came several years later. It was the summer of 1987. My family was staying at Sugarbush Resort in the Green Mountains of Vermont when we stumbled into the little town of Waitsfield one day. 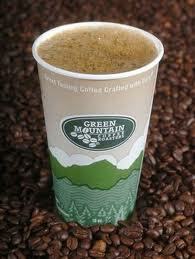 In a quaint little tourist mall, we came upon Green Mountain Coffee’s little coffee shop. I had never seen a shop like this before. It was completely dedicated to coffee. And not just one kind of coffee, but lots of different types of coffee. Up until that time, coffee was something you bought in a can . . . at the grocery store. I was amazed at the sight, and doubly amazed that they offered something called “flavored coffee.” I had never heard of such a thing. After nearly 25 years, I’ve rediscovered Green Mountain Coffee with my Keurig machine. Like my experience with the Irish cream coffee of old, I’ve never tasted anything like Green Mountain’s “Double Black Diamond” coffee. My first cup of this stuff was like stepping back in time to that little shop in Waitsfield and being amazed all over again!